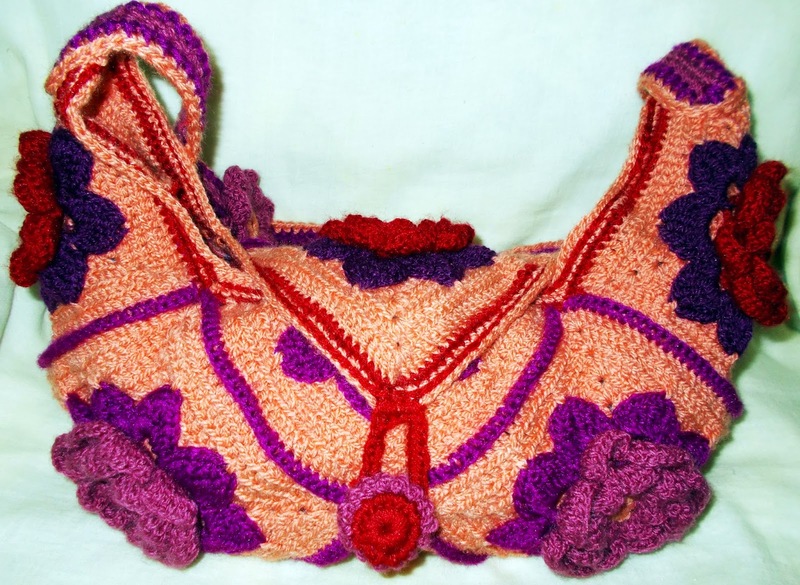 Inspired by this gorgeous looking bag which I found at this blog, the pattern of which is sold for $8 (around Rs. 480), I was determined to make a similar one my own. I could have purchased the pattern, because I really like the bag, as long as the price is reasonable enough but Rs. 480 for a pattern is too much. So I made one, instead! The flower pattern seems simple enough, I thought, and the square, well, there must be a tutorial video on how to make it somewhere. 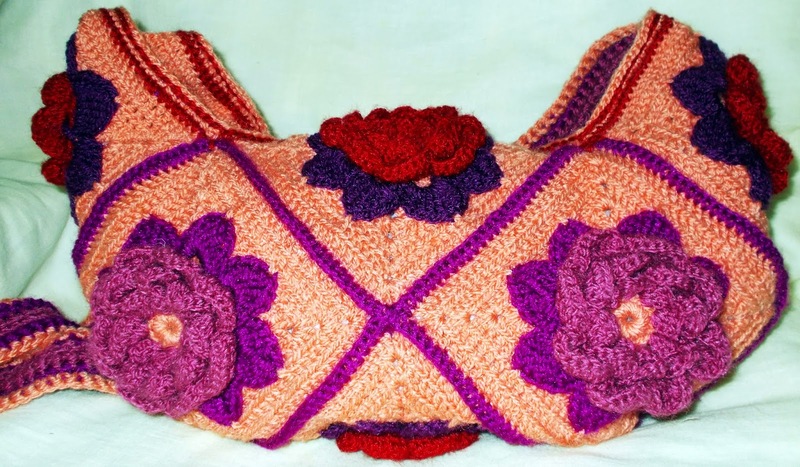 So I spent some time browsing the internet searching for a free pattern or a video tutorial. Around this time, I have already subscribed to one of the best tutorial videos on youtube -sheruknitting. So after some time, I decided to use one of her flower patterns with a few modifications to serve the kind of result I wanted. So, here is the result of that determination to make one my own. Although the model is made of three colors, what happened to mine is that I ran out of yarns and I was confident that I could get more only to be disappointed when the three shops ran out of two colors and the shop owners couldn't tell me whether they could get these colors again. So instead of waiting and not finishing this project, I decided to use different colors. So as you can see in these pictures, there are 5 colors. The only consistent color is the square and the middle part of the flower, which is peach. Well, the bag just turned out lovely! This is the back side of the bag. There are 8 squares in this bag and 1 one-half square. 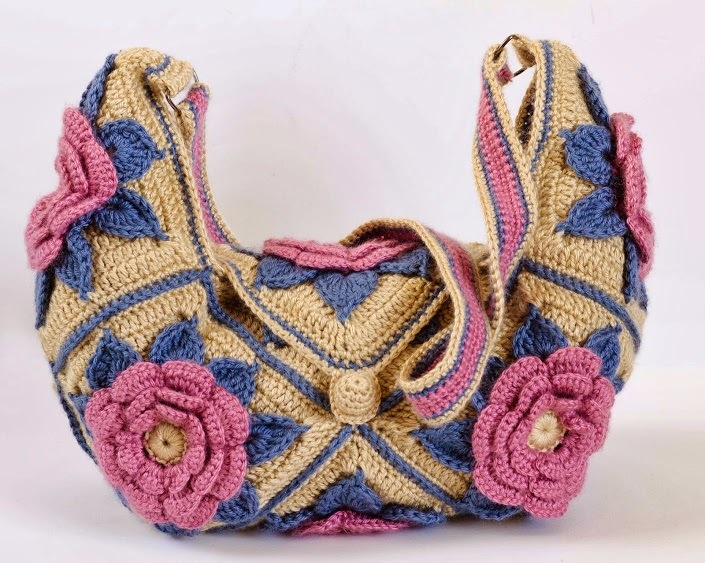 This is the front of the bag highlighting the handle, where I attached a folded petal flower, the pattern of which is designed by sherru studio, to give the handle an elegant look. I used two threads together in crocheting the handle for strength. 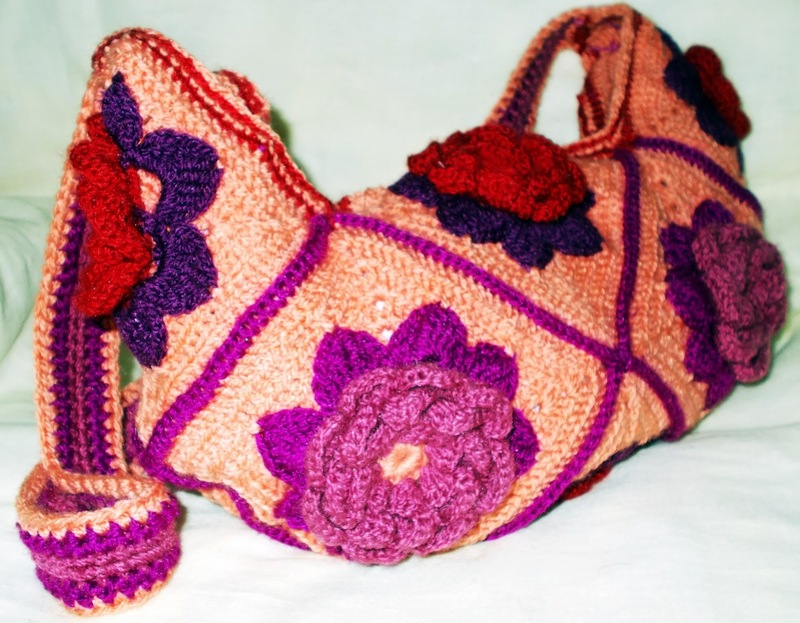 Take a whole look of this granny square flower bag...took me quite many days to finish this project. But there is something that makes me happy doing it. I have not used it yet, but I will certainly take a photo when I get the chance to use it outside. This is the side view of the bag to take a closer look at the flower, the square and the stitches that were used to sew two squares together. Finally, this bag used an acrylic type of yarn. To make a bigger version use a 4mm or above size hook. You can use a different flower design. I just chose the 8-petalled flower to make it easier to start making the granny square. I put a lining inside just to make sure nothing falls off the bag. As usual, the lining is out of my husband's short pants, old but not used much because he didn't like the clothing...which is actually suited for this lining. It already has pockets so I used those sides of the shorts particularly for the lining where I can keep my phone, wallet and other small stuff like keys. 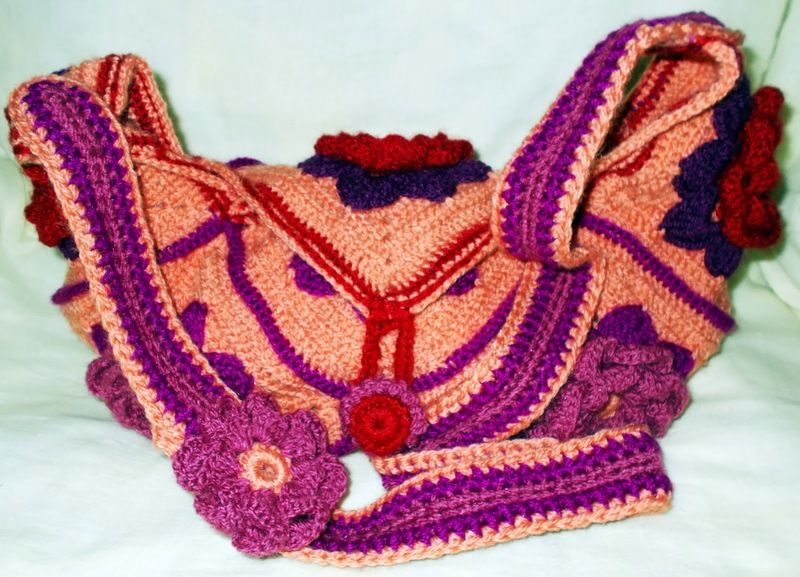 I have not written the pattern of this bag but if you know crochet already it's not difficult. Like I said, the flower pattern is by sheruknitting studio (8-petal folded flower) and I just added 8 more petals to serve as leaves. Thank you! I got inspired by your gorgeous flower tutorials so I finally made one!